This is a game I should have probably never sold, but - thanks to Dave - its back in my stable! This PCB was originally MrMonkeyMan's on which he set the western record, which is a cool plus, but really, I'm just so stoked to have a Ketsui PCB back in the house! It's fun playing this in MAME, but its justy not the same as playing it on a cab. It's such a fun game and my Saturn pad, while awesome for some shmups, just doesn't work for me on Ketsui. 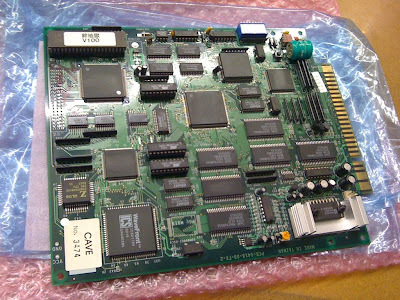 Its pretty cool that my first post on this very blog was about first getting this PCB (http://suicidebullets.blogspot.com/2008/01/ketsui-arrives.html) and I feel just as stoked to own it again. I hope to laydown a new high score soon and see just how far my skill set has come in the last few years since owning this beauty. I think I have the skills to finally nail the 1CC with some work. I was amazed when I got MAME to work with Ketsui just how much I remembered in terms of enemy placement and timing. I'm ver happy to have this back in the stable and it's going to take quite a lot to get me to part with it again! Thanks, Dave. BTW - anyone ever notice how the paking material for the PCB in the kit is blue and pink - just like the bullets in the game? Coincidence...? I've been really wanting to pick up the PCB for this too after playing it in MAME. I had never played it before it finally became emulated and I find myself playing it way more than the DFK 1.5 PCB I bought recently. I've been thinking of trying to trade my DFK 1.5 for Ketsui if anyone was willing but I kinda doubt that (even though DFK is technically worth more monetarily). Ketsui is just so raw. I can only imagine how burly it would sound cranked all the way up on my New Astro City. I've only been able to get to Stage 4 on 1 credit so far. By about the Stage 4 mid-boss the game just starts to beat me down. Stage 5 is just brutal. Stage 4 and 5 are pretty brutal - especially when playing for score. I have found that my starts for stage 4 are pretty good, but there's a lot to learn there, so I always make a few mistakes. Its an awesomely visceral experience and on that shouldn't be missed by any committed STG player. Yeah I have been grinding away at it in MAME and I can consistently get to Stage 3 boss, and on a good day get to Stage 4 mid-boss. When I credit feed to stage 5 I start wondering how in the heck I'm supposed to even make patterns for the stage. Its pretty tough. Yeah, man - making patterns for stage 5 is brutally tough. If you watcha a superplay or two, you'll get a realy aggressive version of what you should be doing and kind learn the flow from that. I typically get to the fifth stage and start thinking 'bomb' more often than the stages before. That being said, I tend to credit feed every credit through to the end and in doing that, I have built a sort-of pattern for stage 5. Saw your sale thread on shmups - good luck - getting Ketsui is a great investment. Always sought after and excellent. Hah - yup, it's ok. We got to get you to pony up for the pcb one of these days. I'm sure family and responsibility come first, but damn its good. Certainly in my Top 3 of all time. I'm still contemplating if I should sell my DFK and get Ketsui, or just bite the bullet and buy Ketsui too. I've dropped a lotta money on arcade stuff this year already so I dunno. That's a tough call - especially with the economy, blah blah blah - you've heard it all before. DFK was pretty cool when I borrowed a pcb. I did enjoy it, but for me, Ketui is pretty much the bee's knees. It'd be hard to really know until you have owned the two of them. You can think of it this way though - DFK will probably drop a bit in price as we go forward and Ketsui pcb's are really gonna stay pretty steady - at least that's the bet I would make. Ketsui pcb's, I imagine, will creep back to the 1G mark at some point. There's been a port and it's still selling for $800+. Good value and return on investment. And a stupid fun game too. I'd sell DFK, get Ketsui and you can always switch it up in the future. Trust me, pcb's of each will always be for sale on this board. So I got my Ketsui PCB. Right off the bat I noticed that the framerate is markedly smoother on the PCB than it is in emulation. I haven't played the XBOX360 port so I can't compare that to the PCB. I'm already getting better scores on the PCB than I was in MAME too. Very glad I traded DFK for Ketsui. Hey, is there any kind of trick to get around that annoying cris-cross pattern on the Stage 4 boss? So far Stage 2, 3, and 4 bosses have that one annoying pattern that screws me up. On Stage 2 its the sweeping pink bullets, on Stage 3 its the final pattern, and on Stage 4 its the cris-cross blue bullet lines..
Little late here, but I'd probably recommend ALOT of practice on that boss - the pattern is not too hard once you get use to it.